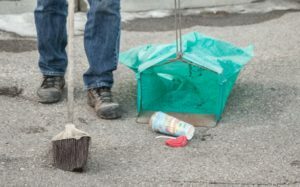 This is a guest post from Brian Winch, creator of Cleanlots, a parking lot litter removal business that began as a side hustle and has grown into a successful career. A little over 35 years ago I was at a personal crossroads. I worked full time at a retail establishment, but I knew I wanted more out of life than stocking shelves and ringing up customers. With only a high school diploma, a small savings account and plenty of bills to pay, I wasn’t sure what opportunities would come my way. So I decided to pave my own way and devise a plan to make extra money on the side with a side hustle! As a child, I recalled that my father used to make extra money on the side by cleaning up litter in a nearby shopping plaza. I had gone along with him a few times, and I remembered thinking how easy it was. It was a case of us walking around the property cleaning up litter before the stores opened the next day and getting paid for it. I’ve always loved the outdoors and had a passion for the environment. Marrying those ideals with this childhood memory, I began to grow my side hustle until I was making enough money to quit my retail job. Would most people describe my business as glamorous? Probably not … but a litter removal job has many advantages – if you can see past the trash. How successful you become depends only on your work ethic, persistence and attitude. Working within a Green industry. I have a great sense of pride and satisfaction knowing that my business is making a cleaner, greener environment. Not everyone wants to clean up after people- I get it. However, I enjoy making a noticeable impact in my community with this green service. How many jobs can you name that will pay you to take a walk? In parking-lot litter removal you are taking care of yourself as well as your customers and the environment. 10,000 steps a day? No problem! Are people littering less than they were 30 years ago? I can assure you: NO! People don’t tend to think litter is an issue unless they shop at a messy property. Property owners have a hard time keeping up and that’s where we step in! When I decided to launch my side hustle idea I only invested about $200. There are no unique skills or training involved. (Remember: I started this business with only a high school diploma!). Eventually, I grew my business enough to recruit others to help me with the cleanup work. Now that $200 side hustle investment has turned into a $650,000+ per year business. You can bill your time out from $30 – $50 per hour. Contract work means money coming in month after month, year after year. The simple hand tools make cleaning up almost as fast and easy as going for a walk! It doesn’t interfere with a 9-5 job. This service is completed out of the sight of customers-which often means getting your side hustle on during evenings or early mornings. I’m often asked, “If this business is so good, why share it with anyone?” The fact is this business is successful at the local level. I couldn’t operate in your city just as you couldn’t in mine. The truth is, I have nothing to lose by teaching you what I know so you too can make extra money on the side. I believe it’s a win/win situation for the both of us (as well as Mother Earth). To learn more about Brian’s journey and to get more information about how you can open your own parking lot litter removal business please visit http://www.cleanlots.com. Do you have a side hustle? What do you do for extra money?